All StrongBox Enclosures are custom made-to-order. Integra Enclosure’s new StrongBox NEMA 4X Stainless Steel Line is fully customizable to fit your application; tell us what you want, and we’ll deliver within the industry’s fastest lead times. With over 30 years of proven manufacturing experience, Integra Enclosures manufactures and delivers UL approved products to customers when they want it and how they want it. Using our state-of-the-art technology and proven designs, we specialize in the custom sizes and configurations that you need. We don’t inventory product, we custom build each and every enclosure. 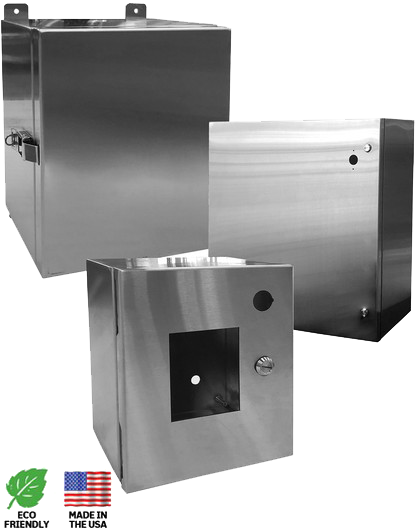 Our stainless steel enclosures are designed to protect any indoor or outdoor application against corrosion, chemicals and wet conditions. It is constructed with UV protected and Impact resistant material to ensure protection in any environment. Each enclosure is custom made to any specification or size. The StrongBox NEMA 4X is constructed in accordance to UL50E NEMA 4X specifications using the best material to fit your application. We offer a variety of latch, mounting and hinge configurations, as well as custom machining, to ensure your enclosure has the required dimensions, accessories and holes you need. Each enclosure uses industry leading foam-in-place gasket and is finished with grade #4 finish.